C. Ronald Ellington joined the Georgia Law faculty in 1969. 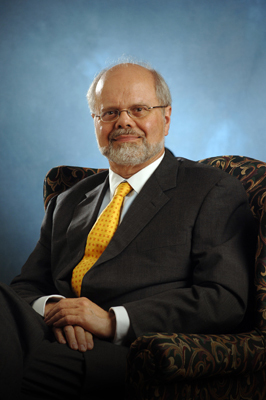 He retired at the end of the 2008-09 academic year but continued to teach Georgia Practice and Procedure through the spring of 2013. His areas of speciality were civil procedure, Georgia practice and procedure, complex litigation and the law and ethics of lawyering. During his time at the law school, Ellington served as dean from 1987 to 1993. In 2006, he was one of three professors campus wide to be named a Josiah Meigs Distinguished Teaching Professor, UGA's highest honor for teaching excellence. Ellington currently serves as reporter/consultant for the State Bar of Georgia Committee on Standards of the Profession, where he is playing a major role in the development and implementation of the State Bar's mentor/mentee program for newly admitted lawyers, the Transition Into Law Practice Program, which is being considered by other states as a model to implement. In 2000, he was appointed as a member of the State Bar of Georgia's Formal Advisory Opinion Board. Ellington previously chaired the State Bar of Georgia Judicial Procedure and Administration Committee and served on the Chief Justice's Commission on Professionalism. He is also a member of the American Law Institute. A respected teacher and scholar, Ellington has been presented with the Faculty Book Award for Excellence in Teaching by Georgia Law students and has received the Professional Responsibility Award, both on multiple occasions. In 1994, he served as a Senior Teaching Fellow at UGA and, in 2000, he was inducted into UGA's selective Teaching Academy. Ellington earned his undergraduate degree from Emory University and his law degree from the University of Virginia, where he served on the managing board of the Virginia Law Review. He received his Master of Laws from Harvard, after being awarded a Fellowship in Law and the Humanities for graduate studies at that institution. Then, he practiced with the law firm Sutherland, Asbill & Brennan in Atlanta for three years before joining the Georgia Law faculty. Samuel M. Davis: Reminiscenses, 85 Miss. L.J. 929 (2016). Milner Ball: My Student, My Teacher, 41 Ga. L. Rev. 749 (2007). The ABA Section of Litigation’s Ethical Guidelines for Settlements, 52 Mercer L. Rev. 891 (2001). Learning to be a Lawyer: Transition into Practice Pilot Project, 6 Ga. B. J. 8 (2001) (with S. Winkler and J. Marshall). 'Narrowing the Gap' - Hither How?, 26 Ga. St. B. J. 164 (1990) (with Dorothy Toth Beasley, Richard W. Creswell, Thomas C. Arthur and Roy M. Sobelson). History of the University of Georgia School of Law, 26 Ga. St. B. J. 186 (1990). Trial Practice and Procedure (Annual Survey of Georgia Law), 38 Mercer L. Rev. 383 (1986). In Memoriam: Vaughn Charles Ball (1915-1985), 20 Ga. L. Rev. I (1986). Trial Practice and Procedure (Annual Survey of Georgia Law), 37 Mercer L. Rev. 413 (1985) (with T. Bart Gary). Trial Practice and Procedure (Annual Survey of Georgia Law), 35 Mercer L. Rev. 315 (1983) (with T. Bart Gary). Trail Practice and Procedure (Annual Survey of Georgia Law), 34 Mercer L. Rev. 299 (1982). Trail Practice and Procedure (Annual survey of Georgia Law), 33 Mercer L. Rev. 275 (1981) (with T. Bart Gary). Unraveling Waiver by Default, 12 Ga. L. Rev. 181 (1978). Commerce Power See Saw: Balancing National League of Cities, 11 Ga. L. Rev. 35 (1976) (with J. Ralph Beaird). Prospects for Individual Freedom Toward Greater Fairness for All, 7 Ga. L. Rev. 410 (1973) (with J. Ralph Beaird). Current Problems with Venue in Georgia, 2 Ga. St. B. J. 315 (1975). Book Review: Commentaries on the Constitution of Virginia (1974), 10 Ga. L. Rev. 306 (1975). Hawkins v. Town of Shaw: The Court as City Manager, 5 Ga. L. Rev. 734 (1971). Principle of Nondivisiveness and the Constitutionality of Public Aid to Parochial Schools, 5 Ga. L. Rev. 429 (1971). Cases and Materials on Georgia Practice and Procedure, 2012 ed. (LAD Custom Publishing 2012). Cases and Materials on Georgia Practice and Procedure. (University of Georgia School of Law, 1992, Supp. 1994) (with Robert Brussack). Cases and Materials on Georgia Practice and Procedure. (University of Georgia School of Law, 1982) (with Thomas F. Green and J. Ralph Beaird). A Study of Sanctions for Discovery Abuse: A Report Submitted to the Office for Improvement in the Administration of Justice, United States Department of Justice. (Ellington, 1979). Cases and Materials on Georgia Practice and Procedure. (University of Georgia School of Law, 1976-1981) (with Thomas F. Green and J. Ralph Beaird). Cases and Materials on Georgia Practice and Procedure. (University of Georgia School of Law, 1972) (with Thomas F. Green and J. Ralph Beaird). Final Report of the University of Georgia School of Law Study. (University of Georgia School of Law, 1970).